As the number of products in your Online Store grows, you can find them more easily by product category, name, or the product's SKU code. Click on your Products tab then click Products. 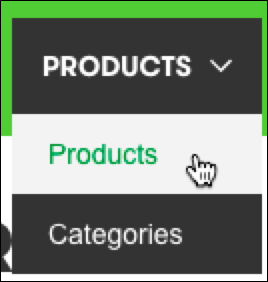 Use the Filter By menu to select All Products or a particular product category, such as Men's. Use the Search field to enter the Name or SKU of the item you want to find. Sort by the Name, Price, Sale price, or SKU. Press Enter/Return on your keyboard to start your search. Added products to my Online store and when published, products are missing. Why?